An example of information that I thought was very interesting and well done was this piece done by Lokesh Dhakar about coffee. This is a very simple and easy to understand chart showing what is in the different types of coffee drinks you can get at a coffee shop. I though that he used a very creative way to help people better understand what exactly is in the different types of coffee drinks. 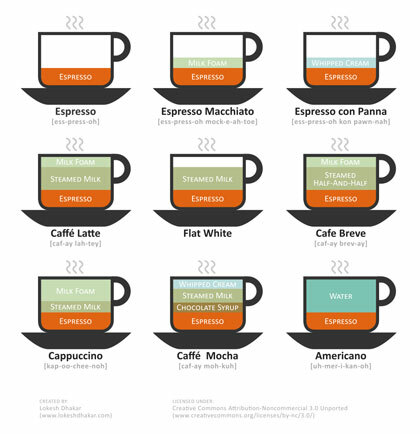 There are so many different types of coffee drinks today that it can be difficult to keep straight what each one is so I think that this is a very helpful and interesting diagram. More information about this diagram and Dhakar himself can be found at his blog.